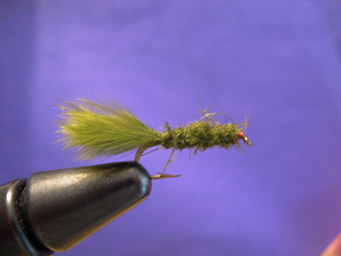 The art of fly tying dates back to centuries ago. Today, fly tyers are still improving on old patterns and also inventing new ones. Below, we give you some essential stream and lake flies, as well as some step-by-step ties in the "Featured Fly" section. Nick's Comments: This is one of my creations. All this one is, is a royal trude, but I substituted natural material with synthetics wherever I could. My use of macramé for the wing, olive antron dubbing for the body instead of brittle herl, and yarn for the tail helped to make this fly much more durable. I still use brown hackle, but I give the thread-base a dose of nail polish before I wrap the hackle, then I wrap the hackle onto the wet nail polish. This fly stands up to all the abuse I give it, and I have used the same one to land over 80 cutthroats. This is a terrific fly for pocket water and if you leave the red out of the middle, making it a solid olive colour, it makes a good caddis imitation as well. 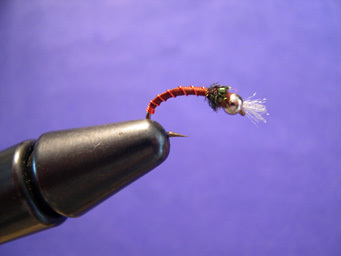 If you like, use some white rubber legs to give the fly some added motion. That drives the cutts crazy. Nick's Comments: Many people tie this fly with either deer hair or CDC for the wing, but I prefer elk hair as it is the most durable. I prefer this fly to more common ones in this area such as adams and thorax flies for a few reasons. 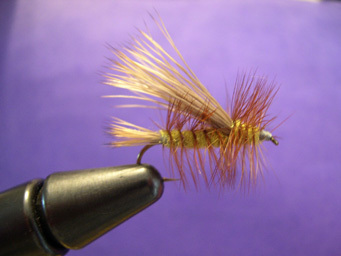 One is that it is cheaper and easier to tie (no expensive hackle). Also, I find they last longer, and float longer than an adams; and it is also easier to see, as I tie a tall wing on them. The elk hair allows it to land perfectly every time, and seems to fare better than a brittle hackle stem. I like this one in a myriad of colours, and particularly like it in smaller sizes. Nick's Comments: Again, this is a very well known fly within Western Canada. This is perhaps the best small creek fly I carry, as it floats for a long time, and there is at least some sort of caddis hatch most summer days, so the fish are very used to seeing them. 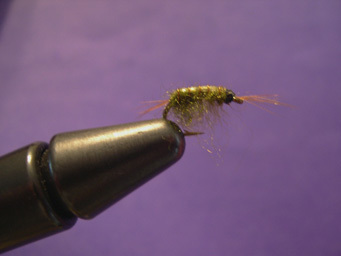 I am a really big fan of a caddis with a grey body and brown hackle. Nick's Comments: I won't go on about this one for long mainly because I haven't met a fly fisher who doesn't carry them on streams. 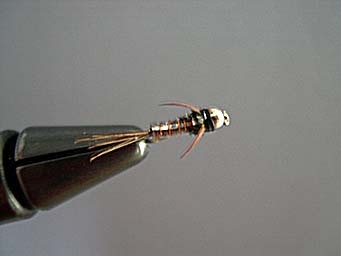 I prefer not to use a bead head but rather wrap lead wire around the front third of the hook shank. Carry this in a #6-18 and you're set. The larger sizes are great stonefly patterns. Nick's Comments: This This is one awesome fly, and it would be a tough argument to convince me of a better trout fly for summer stream fishing. Basically this one represents a stonefly or hopper, but it could also be a caddis in smaller sizes. Because high altitude streams see a lot of golden stones all summer long (or at least through July and into August), yellow is my favourite colour. I tie this one in a #8-14, but up to size 4 in orange can be used when fishing it as a salmonfly. Nick's Comments: This is one great fly. Tim and I came up with this one many winters ago, and we really put it to the test. It proved its worth within one trip, and we now carry a lot of them anywhere we go. Although we are probably not the first ones to come up with the modifications that we use, I haven't seen any other pheasant tails tied this way, so we decided to name it ourselves. What it is, is your standard PT nymph with a strip of mylar along the top of the back, a silver bead head (not the traditional copper bead) and two goose biots sticking out along each side of the thorax. A strip or two of mylar can substitute the pheasant tail wing case if you would like. Tie this one in a #10-18 and it will work well for you. This fly is great if the water is a bit off colour. It is a great nymph for high mountain lakes, and for nymphing early season stillwater rainbows. Nick's Comments: OK, I just had to get this one out of the way. This one needs no introduction, as it is very well known to fly fishers in Alberta and BC. This one is perhaps our most versatile fly, and it can catch trout under almost all conditions we may encounter: be it sunny skies, rainy, high, murky water, or low and clear water. I like this one in large (#2-6) for river fishing, and in a little bit smaller sizes for creeks. This is not always the case and all sizes and colours should be carried. As mentioned earlier, I particularly like this one when tied heavy, and when crystal chenille is used for the body. Nick's Comments: I couldn't narrow this group down, even though I only really use 3 of them. The royal wulff is probably the most famous one of the bunch, and it is also my personal favourite. I also enjoy using an olive wulff for green drake hatches, and grey wulffs for grey drake hatches. When I tie royal wulffs, I substitute macramé for calf tail as it is more durable, and is easier to tie with. 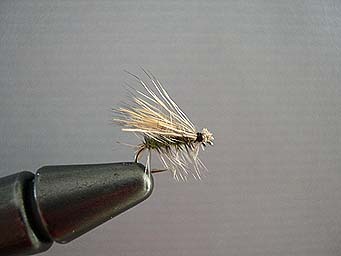 Along with stimulators, elk hair caddis, and the cheap trude, these flies are up there for the best searching flies in the west (in my opinion). I use anything from a #6 to a #18 or 20. Tim's Comments: Ever since the first day I used this fly, it has yielded many fish. After its initial success on pothole lakes, we took it out on many different lakes around Alberta and British Columbia, and many times it is the first fly I put on when fishing unfamiliar water. This fly is essential when fishing lakes. Many different fish love this fly. 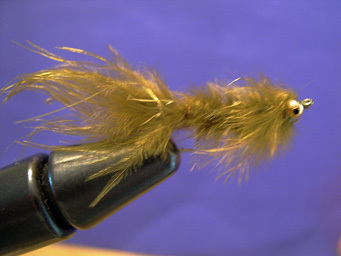 Perch, Walleye, Bass, Trout, and even whitefish have been taken on the BH Mohair Leech. The mohair body and marabou tail give the fly a life-like motion that fish can not resist. 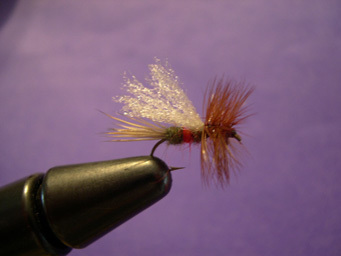 Often, when other patterns aren't working, this fly will come through once tied on. My favourite ways to catch fish with this fly are to suspend it under an indicator on a floating line, or with the use of a full sink line (preferably intermediate sink). Experimenting with different retrieves and depths is the key to success on the sinking line, but once you find them, hold on tight and be prepared for some good fishing. Tim's Comments: Chironomiding is a very effective method of catching trout. There are many different patterns, and the Candy Cane would be one that I wouldn't leave home without having in my box. Though it looks more like an attractor than anything, the Candy Cane can actually imitate the silver color when gas and air is trapped, and the chironomid pupae elevates to the surface of the lake. My favourite time to fish this pattern is early Spring until late June. In most cases a size #14 is perfect, although you should adjust to whatever size is hatching. 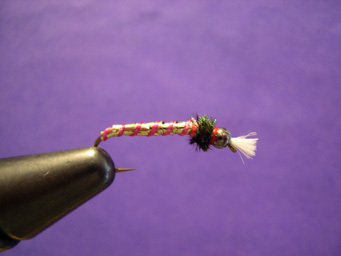 Nick's Comments: This is a very easy fly to tie, yet it is very effective. 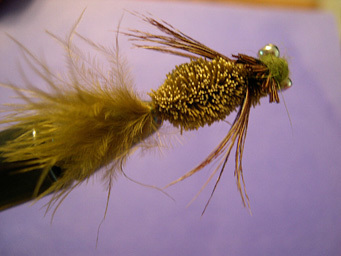 Simply tie in the tail, put some dubbing wax onto the thread and dub a body of marabou. How I fish it is "chironomid style". Put an indicator on about 6-10 feet above the fly and let it sit there. Keep a tight line, and give it a twitch every few minutes, but no more than that. 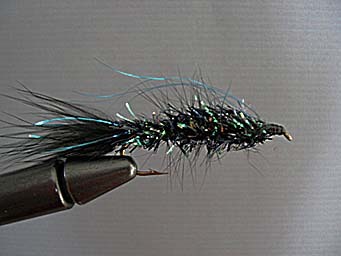 This fly works really well in the early spring, before any major hatches have begun. Nick's Comments: This is one of the staple flies (but I guess you can say that about all of the flies on this list) any angler should carry when fly fishing trout lakes. You can successfully use them anytime during the open water season; but the best time is Spring and Fall. Always carry at least a modest selection. My favorite way to tie these flies is with a thread body, and wire ribbing. This is very simple, and it works extremely well. You can use any colour of thread you want, but always be sure to have some in black, brown, light and dark olive, maroon and red. I vary the colour of ribbing from silver, copper, red, to gold. Just match the colour to the hatch in your area. Tim's Comments: Once spring hits, damselflies become quite active making them a great food source for trout. 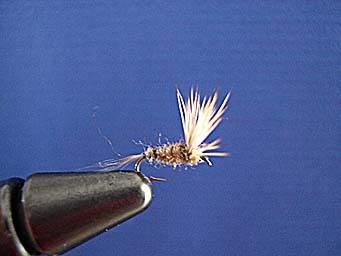 This insect is a target for trout until around late July. By that time the majority of damsels have hatched, so the trout key in on them to a much lesser extent. There are many variations of patterns tied to imitate these insects, and many of them, from the simplest tie to the intricate pattern will catch fish when fished properly. I like to fish these patterns on a floating line or a clear intermediate sinking line since the fish like to hit them closer to the surface of the lake. Fishing near reed lines where damsels emerge is often a good bet, and can be a lot of fun. Slow steady retrieves with short pauses, or long, slow pulls are often all it takes for a hard hitting fish to slam your offering. Remember to bring many of these in your box, unless you can get away with larger tippet, because the trout seem to hit damsels harder than any other pattern! Tim's Comments: As a staple food source of trout in lakes all year round, Dragonfly Nymphs are a necessity if you plan on fishing lakes at any time of year. Though they are not as prolific as leeches and scuds, trout key in on these big meals when the opportunity arises. When tying up flies, there are two main species of dragonfly nymphs to imitate. The smaller of the two is the Libellulidae, and the larger is most commonly known as the Darner. When developing the Tim's Dragon, I took all the factors into consideration, and when tied from a size #4 all the way down to a size #12, both common species can be imitated by this pattern. I most often use dragonfly nymphs in the summer, fished on a sinking line near the bottom. Short jerky retrieves, or long, slow pulls near reed lines, fallen logs on the bottom, or drop-offs often produce many trout or bass. Hook: #8-18 "Egg" or "Curved Caddis"
Nick's Comments: Okay, this will be short. 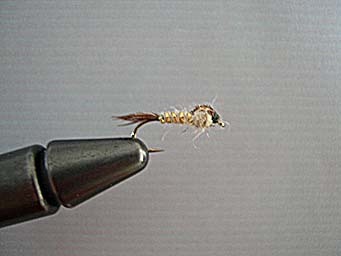 This is one of those flies I reach for when nothing else is working, because in my opinion it's dead boring to fish them. Their success is why this fly is on this list however, and it can really save the day when nothing else is working. Scuds can be fished almost any way imaginable, but my favorites are fishing it on a sinking line right along the bottom, or using it as a dropper fly off a leech or chironomid. All content Copyright © 2000-Present Western Sportfishing. All Rights Reserved.